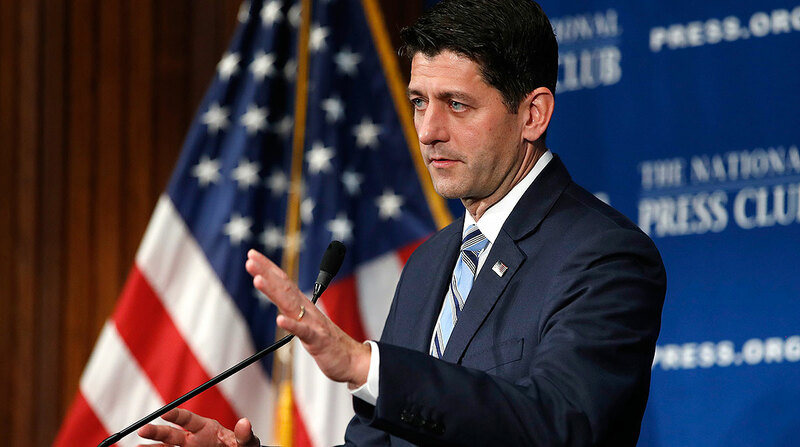 House Republicans have focused on a pro-growth economic agenda during President Donald Trump’s first two years in office that was not anchored on infrastructure policy, House Speaker Paul Ryan reminded voters with the November midterm elections less than a month away. Speaking at the National Press Club on Oct. 8, Ryan (R-Wis.), who is not seeking re-election, claimed constituents benefited financially under a Republican-led House during his tenure, and they would not realize similar economic advantages if Democrats were to win control of the chamber after the midterms. The speaker also highlighted last year’s passage of a tax overhaul bill enacted into law, which earned praise from the business class and freight executives. “Through tax reform alone, nine out of 10 workers will see more take-home pay. At least 6 million workers have received raises, bonuses and better benefits. And people in at least 49 states are seeing lower utility bills,” Ryan added. With regard to infrastructure, House Republican leaders listed on their website House-passed aviation and water policy bills that aim to help boost manufacturing, as well as increase employment throughout the construction sector. The aviation law, enacted earlier this month, looks to modernize aviation programs and promotes security at airports nationwide. The law also provides $1.68 billion to the regions affected by Hurricane Florence. The water infrastructure measure, which awaits consideration in the Senate, would seek to address flooding risks, promote water quality and aim to enhance freight access along waterways. Streamlining regulations and improving safety also are priorities outlined in the water bill. Senators have indicated they intend to work on the bipartisan legislation this month. House Republican leaders also touted passage of legislation that would update permitting requirements for oil and natural gas pipelines and electric transmission facilities crossing international borders. They also noted they advanced legislation to promote new hydropower infrastructure, and a bill that would establish a “one-stop shop” permitting process through the Bureau of Reclamation. The aim is to streamline multiagency permitting processes for new or expanded nonfederal surface storage facilities. Notwithstanding their recent record, Republicans in the House avoided action on a 10-year, $1.5 trillion infrastructure proposal Trump unveiled in February that would rely heavily on public-private partnerships. Additionally, an outline of infrastructure funding proposals that outgoing Transportation and Infrastructure Committee Chairman Bill Shuster (R-Pa.) unveiled during the summer that called for raising taxes on fuel also failed to garner enthusiasm from the Republican caucus. Funding authorization for infrastructure programs under a 2015 highway law expire during the upcoming presidential election year. Two top Republican transportation policymakers, Reps. Jeff Denham of California and Sam Graves of Missouri, have expressed a commitment to advance a large-scale infrastructure package early next year, if Republicans remain in control of the chamber. If Democrats win the House, however, leaders of that party have indicated they likely will devote considerable time reviewing the Trump administration’s operations. Besides oversight of Trump programs, Democrats also will push back on an infrastructure proposal that would rely heavily on public-private partnerships. And, with Trump seeking legislative victories ahead of his 2020 re-election bid, House and Senate Democrats will be reluctant to assist a rival candidate on a major infrastructure package. Election analysts, such as the Cook Political Report, note that voters in November are expected to give Democrats control of the House. The party is likely to gain more than the requisite 23 Republican-held seats to flip the chamber. Republicans remain the favorites to maintain control of the Senate, most analysts continue to determine.